Exclusive! Our Floral Burnout Tee is uniquely chic! A fabulous technique called burnout creates a sheer, tone-on-tone pattern on soft, supple, white jersey. 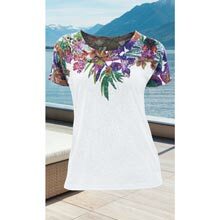 A lavish, tropical print yoke adds eye-catching colour. Easy, pullover style in polyester/rayon knit with short sleeves and scoop neckline. Machine wash. Imported. Misses, approx. 26"l. Hurry! Quantities are limited!